Not to be confused with Oliver King. 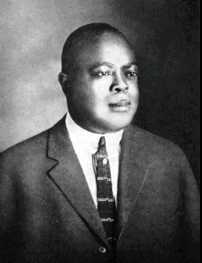 Joseph Nathan "King" Oliver (December 19, 1881 – April 10, 1938) was an American jazz cornet player and bandleader. He was particularly recognized for his playing style and his pioneering use of mutes in jazz. Also a notable composer, he wrote many tunes still played today, including "Dippermouth Blues", "Sweet Like This", "Canal Street Blues", and "Doctor Jazz". He was the mentor and teacher of Louis Armstrong. His influence was such that Armstrong claimed, "if it had not been for Joe Oliver, Jazz would not be what it is today." Joseph Nathan Oliver was born in Aben, Louisiana, near Donaldsonville in Ascension Parish, and moved to New Orleans in his youth. He first studied the trombone, then changed to cornet. From 1908 to 1917 he played cornet in New Orleans brass bands and dance bands and in the city's red-light district, which came to be known as Storyville. A band he co-led with trombonist Kid Ory was considered one of the best and hottest in New Orleans in the late 1910s. He was popular in New Orleans across economic and racial lines and was in demand for music jobs of all kinds. According to an interview at Tulane University's Hogan Jazz Archive with Oliver's widow Estella, a fight broke out at a dance where Oliver was playing, and the police arrested him, his band, and the fighters. After Storyville closed, he moved to Chicago in 1918 with his wife and step-daughter, Ruby Tuesday Oliver. In Chicago, he found work with colleagues from New Orleans, such as clarinetist Lawrence Duhé, bassist Bill Johnson, trombonist Roy Palmer, and drummer Paul Barbarin. He became leader of Duhé's band, playing at a number of Chicago clubs. In the summer of 1921 he took a group to the West Coast, playing engagements in San Francisco and Oakland, California. In 1922 Oliver and his band returned to Chicago, where they began performing as King Oliver and his Creole Jazz Band at the Royal Gardens cabaret (later renamed the Lincoln Gardens). In addition to Oliver on cornet, the personnel included his protégé Louis Armstrong on second cornet, Baby Dodds on drums, Johnny Dodds on clarinet, Lil Hardin (later Armstrong's wife) on piano, Honoré Dutrey on trombone, and Bill Johnson on double bass. Recordings made by this group in 1923 for Gennett, Okeh, Paramount, and Columbia demonstrated the New Orleans style of collective improvisation, also known as Dixieland, and brought it to a larger audience. In the mid-1920s Oliver enlarged his band to nine musicians, performing under the name King Oliver and his Dixie Syncopators, and began using more written arrangements with jazz solos. In 1927 the band went to New York, but he disbanded it to do freelance jobs. In the later 1920s, he struggled with playing trumpet due to his gum disease, so he employed others to handle the solos, including his nephew Dave Nelson, Louis Metcalf, and Red Allen. He reunited the band in 1928, recording for Victor Talking Machine Company one year later. He continued with modest success until a downturn in the economy made it more difficult to find bookings. His periodontitis made playing the trumpet difficult. He quit playing music in 1937. As a player, Oliver took great interest in altering his horn's sound. He pioneered the use of mutes, including the rubber plumber's plunger, derby hat, bottles and cups. His favorite mute was a small metal mute made by the C.G. Conn Instrument Company, with which he played his famous solo on his composition the "Dippermouth Blues" (an early nickname for fellow cornetist Louis Armstrong). His recording "Wa Wa Wa" with the Dixie Syncopators can be credited with giving the name wah-wah to such techniques. Oliver was also a talented composer, and wrote many tunes that are still regularly played, including "Dippermouth Blues," "Sweet Like This," "Canal Street Blues," and "Doctor Jazz." Oliver performed mostly on cornet, but like many cornetists he switched to trumpet in the late 1920s. He credited jazz pioneer Buddy Bolden as an early influence, and in turn was a major influence on numerous younger cornet/trumpet players in New Orleans and Chicago, including Tommy Ladnier, Paul Mares, Muggsy Spanier, Johnny Wiggs, Frank Guarente and, the most famous of all, Armstrong. One of his protégés, Louis Panico (cornetist with the Isham Jones Orchestra), authored a book entitled The Novelty Cornetist, which is illustrated with photos showing some of the mute techniques he learned from Oliver. As mentor to Armstrong in New Orleans, Oliver taught young Louis and gave him his job in Kid Ory's band when he went to Chicago. A few years later Oliver summoned him to Chicago to play with his band. Louis remembered Oliver as "Papa Joe" and considered him his idol and inspiration. In his autobiography, Satchmo: My Life in New Orleans, Armstrong wrote: "It was my ambition to play as he did. I still think that if it had not been for Joe Oliver, Jazz would not be what it is today. He was a creator in his own right." Oliver's business acumen was often less than his musical ability. A succession of managers stole money from him, and he tried to negotiate more money for his band than the Savoy Ballroom was willing to pay – losing the job. He lost the chance of an important engagement at New York City's famous Cotton Club when he held out for more money; young Duke Ellington took the job and subsequently catapulted to fame. The Great Depression brought hardship to Oliver. He lost his life savings to a collapsed bank in Chicago, and he struggled to keep his band together through a series of hand-to-mouth gigs until the group broke up. Oliver also had health problems, such as pyorrhea, a gum disease that was partly caused by his love of sugar sandwiches and it made it very difficult for him to play and he soon began delegating solos to younger players, but by 1935, he could no longer play the trumpet at all. Oliver was stranded in Savannah, Georgia, where he pawned his trumpet and finest suits and briefly ran a fruit stall, then he worked as a janitor at Wimberly's Recreation Hall (526-528 West Broad Street). Oliver died in poverty "of arteriosclerosis, too broke to afford treatment" in a Savannah rooming house on April 8 or 10, 1938. His sister spent her rent money to have his body brought to New York, where he was buried at Woodlawn Cemetery in The Bronx. Armstrong and other loyal musician friends were in attendance. Oliver was inducted as a charter member of the Gennett Records Walk of Fame in Richmond, Indiana in 2007. ^ a b Armstrong, Louis (2012). Satchmo: My Life In New Orleans. Ulan Press. ASIN B00AIGW6AS. ^ "KID ORY, 86, DEAD; JAZZ TROMBONIST". New York Times. January 24, 1973. Retrieved 1 February 2019. ^ Balliett, Whitney (1996). American Musicians II: Seventy-one Portraits in Jazz. New York: Oxford University Press. ISBN 978-0195095388. ^ Barnhart, Scotty (2005). The World of Jazz Trumpet: A Comprehensive History and Practical Philosophy. Hal Leonard Corporation. p. 21. ISBN 978-0634095276. ^ Scott Yanow (1938-04-08). "King Oliver | Biography". AllMusic. Retrieved 2015-06-13. ^ a b "Oliver, Joseph "King" (1885-1938) | The Black Past: Remembered and Reclaimed". Blackpast.org. 1922-06-17. Retrieved 2015-06-13. ^ Gerler, Peter. "Joe 'King' Oliver". Encyclopedia of Jazz Musicians. jazz.com. Archived from the original on 18 October 2012. Retrieved 22 April 2012. ^ There is disagreement on the date of Oliver's death. His grave marker says April 8 and this date appears in John Chilton's Who's Who in Jazz, as well as in his biography at AllMusic. However, in his biography at Portraits from Jelly Roll's New Orleans, by Peter Hanley, the author quotes an April 10 date from Oliver's Chatham County, Georgia, death certificate No. 8483. ^ Williams, MT. King Oliver (Kings of Jazz). Barnes; Perpetua (1961), p. 31. ASIN: B0007ECVCE.